The story is reminiscent of what Athens did against the Persians in the early 5th century BCE, but the battle with Atlantis allegedly took place in the 8th or 9th millennium BCE. It would not take much of a historical scholar to know that Athens in 9,000 BCE was either uninhabited or was occupied by very primitive people. This fact would not have concerned Plato's readers because they would have understood that he was not giving them an historical account of a real city. To assume, as many believers in Atlantis do, that there is a parallel between Homer's Iliad and Odyssey and Plato's Critias and Timaeus is simply absurd. And those who think that just as Schliemann found Troy so too will we someday crack Plato's code and find Atlantis are drawing an analogy where they should be drawing the curtains. Plato's purpose was not to pass on stories, but to create stories to teach moral lessons. What can we expect next from these lost scholars? A search for the grave of Cecrops, the serpent-tailed first king of Athens? The discovery of the true trident of Poseidon? Different seekers have located the mythical place in the mid-Atlantic, Cuba, the Andes, and dozens of other places. Some have equated ancient Thera with Atlantis. Thera is a volcanic Greek island in the Aegean Sea that was devastated by a volcanic eruption in 1625 BCE. Until then it had been associated with the Minoan civilization on Crete. To many, however, Atlantis is not just a lost continent. It is a lost world. The Atlanteans were extraterrestrials who destroyed themselves with nuclear bombs or some other extraordinarily powerful device. Atlantis was a place of advanced civilization and technology. Lewis Spence, a Scottish mythologist who used "inspiration" instead of scientific methods, attributes Cro-Magnon cave paintings in Europe to displaced Atlanteans (Feder, 130). Helena Blavatsky and the theosophists of the late 19th century invented the notion that the Atlanteans had invented airplanes and explosives and grew extraterrestrial wheat. The theosophists and James Churchward also invented Mu, a lost continent in the Pacific Ocean. Psychic healer Edgar Cayce claimed to have had psychic knowledge of Atlantean texts which assisted him in his prophecies and cures. J.Z. Knight claims that Ramtha, the spirit she channels, is from Atlantis. 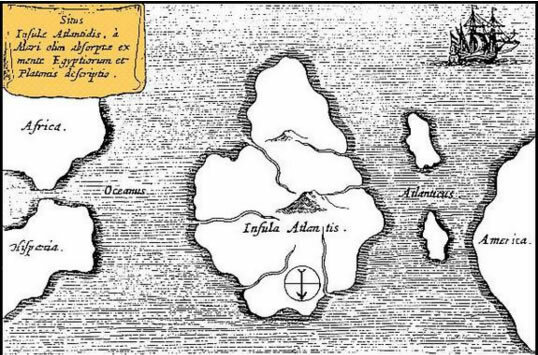 The serious investigator of the myth of Atlantis must read Ignatius Donnelly's Atlantis: the Antediluvian World (1882). In the spirit of von Däniken, Velikovsky and Sitchin, Donnelly ignored Plato's myth and replaced it with a variation on the Biblical myth of the flood that wiped out everything except Noah, his family, and his menagerie. He wrote that Atlantis was sunk in the middle of the Atlantic Ocean during The Flood, but before the cataclysm Atlantis had given rise to the Egyptian and Mayan civilizations and to blue-eyed, red-haired Aryans of Ireland. Much of the popularity of the myth of Atlantis, however, must go to popular writers such J.V. Luce (The End of Atlantis, 1970) and Charles Berlitz, the man who popularized the Bermuda Triangle and the discovery of Noah's Ark. His Doomsday, 1999 A.D. (1981) comes complete with maps of Atlantis and drawings by J. Manson Valentine. Graham Hancock is doing much to keep alive this tradition of "alternative" and "speculative" history and archaeology which seeks a single source for ancient civilizations. Scientists and the BBC don't think too highly of Mr. Hancock's efforts. These "alternative" archaeologists have credited the Atlanteans with teaching the Egyptians and the Mesoamericans how to build pyramids and how to write, etc., arguing similarly to von Däniken that ancient civilizations burst on the scene in a variety of different places on earth and have a common source. Atlanteans or aliens, either way the case can be made for a common source for ancient civilizations only if one selectively ignores the gradual and lengthy development of those societies. One must also ignore that the writing of the Egyptians is no clue to the writing of the Mayans, or vice-versa, and that the purpose of their pyramids was quite different. The Mesoamericans rarely buried anyone in their pyramids; they were primarily for religious rituals and sacrifices. The Egyptians used pyramids exclusively for tombs or monuments over tombs. Why would the aliens or Atlanteans not teach the same writing techniques to the two cultures? And why teach step building in Mesoamerica, a technique not favored by the Egyptians? If you ignore the failures of the early pyramid builders and ignore their obvious development over time, including the development of underground tombs with several chambers, then you might be able to persuade uncritical minds that Giza couldn't have occurred without alien intervention. Finally, one should wonder, I suppose, if the Atlanteans were such technological geniuses who shared their wisdom with the world, why did Plato depict them as arrogant warmongers? Unfortunately for the New Age Atlanteans, there is no credible and convincing archaeological or geological evidence for either Atlantis or Mu. That has not stopped hundreds of people from concocting theories to the contrary. To paraphrase Whitehead, the belief in Atlantis, the ancient and great civilization, is another footnote to Plato. See also alternative science, confirmation bias, pseudoscience, selective thinking, self-deception, any entry listed in New Age Nirvana, or Mass Media Funk 22. Atlantis, edited by Isaac Asimov, Martin H. Greenberg, and Charles G. Waugh (New York: New American Library, 1988). de Camp, L. Sprague, Lost Continents: the Atlantis Theme (New York: Ballantine, 1975). Ellis, Richard. Imagining Atlantis (New York: Knopf, 1998). Feder, Kenneth L. Frauds, Myths, and Mysteries. 4th ed. ch. 8, (Mountain View, California: Mayfield Publishing Co., 2001). Gardner, Martin. Fads and Fallacies in the Name of Science (New York: Dover Publications, Inc., 1957), ch. 14.